“One of the distinctive features of the bluegrass world is that the peak years of careers are often measured in decades, even as we welcome an abundance of new artists and industry professionals into the ranks,” Jon Weisberger, IBMA board chair, explains. “So as our top artists and professionals continue to enjoy recognition from their peers through its annual awards, the IBMA’s Board of Directors saw a need to salute some of the best and brightest among those who are closer to the beginnings of their careers, and created the Momentum Awards — noteworthy for including not just singers, pickers and bands, but events or venues and professionals — as a vehicle for drawing attention to their achievements." Balsam Range is currently nominated for Entertainer of the Year, Vocal Group of the Year, Instrumental Group of the Year and Buddy Melton is up for Male Vocalist of the Year. Balsam Range was also nominated for the Industrial Involvement Award for Colonial Theater, Balsam Range monthly concert series – Canton, N.C.
Catch them at the awards or during World of Bluegrass. A surprise appearance by Connie Hopper - who has been battling breast cancer again after being in remission for 35 years - was the highlight of Wednesday evening. The beloved singer appeared onstage as The Hoppers' hit song, "I've Come Too Far," began to play. The crowd leapt to their feet in thunderous applause and praise to God, welcoming Mrs. Hopper back to NQC. There wasn't a dry in the place as Connie spoke about having the 'peace that passeth all understanding' during this latest health scare. YORKVILLE, Ohio, Sept. 24, 2014 /Christian Newswire/ -- The Chrisagis Brothers (Brian and Shawn) are two men who never stop creating new ways to reach people for Jesus. The popular duo created a woman's conference called "Faithful Women" that became a great success this past month with women from all over the United States being apart of it. Now on the heels of that success the Brothers have decided to do a Christian Men's Conference as well. Men's conferences have been done in the past like Promise Keepers and Full Gospel Business Men but both groups are no longer in existence. So the Brothers have decided on trying to do one called "Fishers Of Men." They want to unite Christian Men and help them become strong in their walk with Christ. The Chrisagis Brothers say that if men would become militant for the things of God they can change the world around them. God wants to see faithful men who believe the Word of God and love the Lord with their whole hearts. It is easy to unite women, women love fellowship, they love to show emotion, they aren't afraid to share or cry, or to love, but men are a different breed. Jesus called men out to be His followers, He showed that men should bond with each other, He showed they could love each other, they could keep each other accountable, they could be faithful, they could be strong, and yet they can be gentle and even cry. So often men have been taught to hold things in and not speak on things. But this is not what this conference is about, it is about becoming brothers in Christ, sharing, caring, seeking God together, growing together and having true fellowship as Christ showed through His brotherhood with the 12 Apostles. He called His followers "Fishers Of Men" and we have taken that name for this conference because that is what Christian Men are called to be. If men became what God wants for them, the family unit would be so much better. There wouldn't be divorce, there wouldn't be abuse and every child would feel the love of his or her dad. The conference is set for March 13th & 14th at Ohio Valley Christian Center in Wheeling, West Virginia and will have not only the Chrisagis Brothers on the roster but International Christian Leaders like Warren Marcus, Stephen Swisher, and Matt Hybarger, plus strong men in ministry from the area like Pastor Don Marsh, Ed Moore, Ric Zambito, Chuck Michaels, and Jeff Garrison to name a few. Pigeon Forge, TN (Sept. 22, 2014) – The Guardians helped Dollywood kick off the park's National Southern Gospel & Harvest Festival today, September 22, 2014. The talented group - consisting of Dean Hickman, Neil Uhrig and John Darin Rowswey - performed four shows at the Backporch Theatre presented by Singing News Magazine. Pigeon Forge, TN (Sept. 22, 2014) – This afternoon - September 22, 2014 - the NQC Board of Directors along with dignitaries form Pigeon Forge, TN and the state of Tennessee took part in a ribbon cutting ceremony signifying the beginning of NQC week at the LeConte Center in Pigeon Forge, TN.The ceremony follows a record-breaking crowd for the kick-off concert last evening. Attendance doubled from previous years as the Booth Brothers, Greater Vision, the Hoppers, the Kingdom Heirs, and the Mark Trammell Quartet ushered in the 57th annual event. Dignitaries included Tennessee state tourism director Susan Whitaker, Pigeon Forge Mayor David Wear, Pigeon Forge City Manager Earlene Teaster, the NQC board of directors along with hundreds of fans. Recently, I have enjoyed sharing e-mail exchanges with a very well-known author whom I have absolutely loved for years. We’ve talked (via e-mail) about life, sports and, of course, music. Come to find out, one of his favorite songs is “Oh, What A Savior”! Wow, who knew?! We have both been a blessing to each other for years…in ways we’ve never known. We all live our lives on two levels: conscience and unconscious. The first is awareness that you are being used for God. That’s great. But greater still is the second level of living when you are unaware that you are being used at all: you’re just going about your life, doing what God has gifted you to do, just happy to be in the game; you’re so wrapped up in your secret and silent relationship with the Holy, Triune God that you don’t notice the trail of blessings you leave in your wake. When this (unconscious living) becomes our reality, then we are no longer “doing” acts of righteousness, but we are just “being” righteous in love, grace and kindness. Why? It’s because the resurrected Christ is working through us. And when that happens, when we are out of the way, well, we are all being used in ways we’ll never know. Pigeon Forge, TN (Sept. 21, 2014) – The 57th annual NQC (National Quartet Convention) kicked off Sunday, September 21, 2014 with a record-breaking crowd at the LeConte Center in Pigeon Forge, TN. Officials report attendance numbers more than doubling previous years records. An all-star line-up of artists - the Booth Brothers, Greater Vision, the Hoppers, the Kingdom Heirs and the Mark Trammel Quartet - helped get Gospel Music's largest annual event underway in grand style. A full schedule of events for NQC week is available online at www.NQConline.com. Nashville, TN (September 20, 2014) The Positive Cowboy, Jim Sheldon, known for his features on 'The Music City Show', broadcast weekly on RFD-TV, has wrangled another Number One on the Country Gospel Music chart. “Mansion In The Sky” is #1 for November on the Country Gospel Chart in the Christian Voice Magazine. You can learn more about Jim Sheldon at http://www.jimsheldonmusic.com or https://www.facebook.com/jim.sheldon . Jim Sheldon can be booked through bev@godseyandassociates.com . Special Shows All Week Long During NQC! Pigeon Forge, TN - The Blackwoods Morning Variety Show will be presenting an 80thAnniversary Tribute to the Original Blackwood Brothers Quartet, the week of Sept. 23-28 at the Smoky Mountain Opry. The Quartet began their career in Choctaw Co., Miss., in 1934. The original members were Roy, Doyle, James, and Roy’s son, R.W. Blackwood Sr. They recorded over 200 albums and sold over 50 million records. They won eight Grammy Awards, four Dove Awards, and were inducted into the Grammy Hall of Fame, the Gospel Music Association (GMA) Hall of Fame, The Southern Gospel Music Association (SGMA) Museum and Hall of Fame, and the Rockabilly Hall of Fame. In 1954, R.W. Blackwood Sr., Bill Lyles and Johnny Ogburn died in a plane crash. R.W. Blackwood Jr., the son of R.W. Blackwood Sr., and his wife, Donna, now continue to carry on the legacy of the Blackwoods. Each day of the Blackwood’s Anniversary Tribute Week will feature different guests. Schedule is as follows: Willie Wynn and Sue Dodge on Tuesday, Sept. 23; Charles Yates and Ann Downing on Thursday, Sept. 25; Jeff Stice, “Mr. Music Man” on Friday, Sept. 26; Kenna Turner Weston Saturday Sept. 27; and Tony Gore, on Sunday, Sept. 28. Special guest for the entire week will be Terry Blackwood (son of Doyle Blackwood, original co-founder of the Blackwood Brothers Quartet). On Wednesday, Country music star, Billy Dean and band will make a special appearance. R.W. and Donna are especially proud as their son, Robbie, is Dean's drummer. “R.W. and I and our group, The Blackwood Singers, are so excited to have everyone join us as we celebrate the 80thanniversary of the Original Blackwood Brother’s Quartet,” said Donna Blackwood. “We want to share this special anniversary with all of our fans and family by presenting a different show daily. We are thrilled to have these other gospel music legends join us. R. W. Blackwood said, “You will hear the songs the Blackwood Brothers made famous and share mornings of great music." R.W. and Donna Blackwood have been performing with The Fee/Hedrick Family Entertainment Group since 2003 and in Pigeon Forge since 2001. They have entertained hundreds of thousands of fans with their gospel show. Although most people associate The Blackwood name with outstanding gospel music, they have an award winning country music background as well. The dynamic Blackwoods Morning Variety Show is a mixture of country, pop, patriotic and gospel harmonious sounds that showcase the talents of Jonathan Lee Kunkle, Brad Smith, and the newest members of the group, Tana Lonon Rogers and Brian Norris in addition to the Blackwoods. They invite audiences to take a trip down memory lane to when the Blackwood Singers had songs on the charts. R. W. Blackwood said, “We have had six country hits in the top 100 Billboard and Cashbox Magazine Music Charts. We are performing some of our more popular country hits and yet not forgetting our gospel roots." The Blackwoods Morning Variety Show is open six days-a-week at 10 a.m. (preshow starts at 9:30 a.m.) at The Smoky Mountain Opry Theater (The show is closed on Monday). Adult tickets are normally $29.95, plus tax. Children 11 and under are $9.95, plus tax. To honor all NQC attendees and anyone wishing to attend the shows, the theater is offering special ticket prices for $14.95 plus tax per ticket or $49.95 plus tax for a ticket that is good for all six shows all week long. Tickets are available by calling (865) 908-SHOW (7469). Groups of 20 or more qualify for group rates, available by calling 1-866-492-6972. The Smoky Mountain Opry Theater is located at 2046 Parkway in Pigeon Forge. For more information about the show, visit www.smokymtnopry.com/shows/blackwoods-morning-variety-show or call 1-800-768-1170 or(865) 428-7469 (SHOW). The show is part of the Fee/Hedrick Family Entertainment Group that includes: “The Comedy Barn®;” “The Smoky Mountain Opry;” “The Hatfield and McCoy Dinner Show;” Happy Days Diner; Chef's Catering and www.SeePigeonForge.com. covering the SGNScoops’ 2014 Creekside Gospel Music Convention and Diamond Awards Celebration at Pigeon Forge, Tennessee on November 3rd and 4th. The television station, which also streams their programs on the web, will be at the Smokey Mountain Convention Center to record the Mondaynight presentation, “Lou Hildreth Honors Willie Wynn” as well as Tuesday night’s Diamond Award celebration, the event to honor Gospel music’s finest artists as chosen by the readers of SGNScoops digital magazine. Many of these special moments will be shown on a TV Special and viewed online at www.watc.tv at a later date to be announced. Coastal Media Group is hosting the Creekside Gospel Music Convention, which takes place from the 3rd through the 6th. As well the special events mentioned above, the Convention includes daily Chapel services, specialty showcases and evening concerts. The Old Paths Quartet are thrilled to officially announce Josh Townsend as their pianist. Josh previously had been flying from his home in Dallas Texas to play select dates, but after he and his mother made the move to Atlanta Georgia, he accepted the position on a full-time basis. At the age of 16, Josh is not only a prodigy at his gift but is a testimony to the Lord's healing power and touch on his life. Shortly after birth, doctors informed his family that Josh had suffered a devastating stroke which would impact his ability to walk and speak correctly. The doctors said Josh would never be able to fully use his left hand, but today Josh is doing more than just proving the doctors wrong, he is using both hands to glorify God with the gift of music. Be sure to come by and visit us at our booth at NQC to meet Josh and see the rest of the guys! Signal Mountain, TN September 19, 2014 This week’s Harmony Road TV program, features styles ranging from concept videos from new and established artists to classic quartet performances. Included are the touching video “Lead me Home” featuring Darrell Freeman, High Road III and their popular “Angel at the Crossroads”, and Willie Wynn, Woody Wright and friends with the classic “Jesus is Coming Soon”. Two top quartets, Triumphant and Brian Free and Assurance are also included. Hosted by Les Butler, this week’s episode originates from the Family Room Studios in Gallatin, Tennessee. The Family Room has been home to gospel music’s top artists and has produced many memorable hits. Robb Tripp and the staff at the Family Room welcomed the Harmony Road crew and provided a great setting for this week’s program. Harmony Road is a weekly Southern Gospel TV program featuring the best in Southern Gospel music and video. Through its family of networks, cable systems local television stations, DirecTV, mobile app and ROKU, Harmony Road is now available to over 85 million homes, making gospel music and its message available to people across the country on a range of secular and Christian outlets. The program is also streamed online from multiple locations. Harmony Road can be found each week on The Heartland Network Sunday mornings at 8:00 Eastern as well as Saturday afternoons on WATC57 in Atlanta and WGNM in Macon. You can also find Harmony Road on Saturday evenings on WBYU in Columbus, GA and the NRB Network Saturday evenings at 8:30 (including DirecTV, ROKU, online streaming and a mobile app). In addition the program is aired on the WALKtv network, WMJN29 in North Alabama and TV24 in Northeast Alabama, Charter cable in multiple cities across Tennessee and more. For more information on these and other affiliates, viewers can visit www.harmonyroadtv.com. Nashville, TN (September 19, 2014) Lily Isaacs is set to appear on Daystar TV on the ‘Joni Table Talk’ program September 22nd. Lily is interviewed by Marcus and Joni Lamb about her book titled “You Don’t Cry Out Loud” which encompasses her life and the Holocaust survival of her parents. She also discusses her conversion to Christianity and her Jewish parent’s reaction. To learn more about Lily and all of the Isaacs got to http://www.theisaacs.com or https://www.facebook.com/TheIsaacs or Twitter at https://twitter.com/IsaacsMusic . If you are interested in booking Lily or the Isaacs go to the Harper Agency at www.harperagency.com or info@harperagency.com . 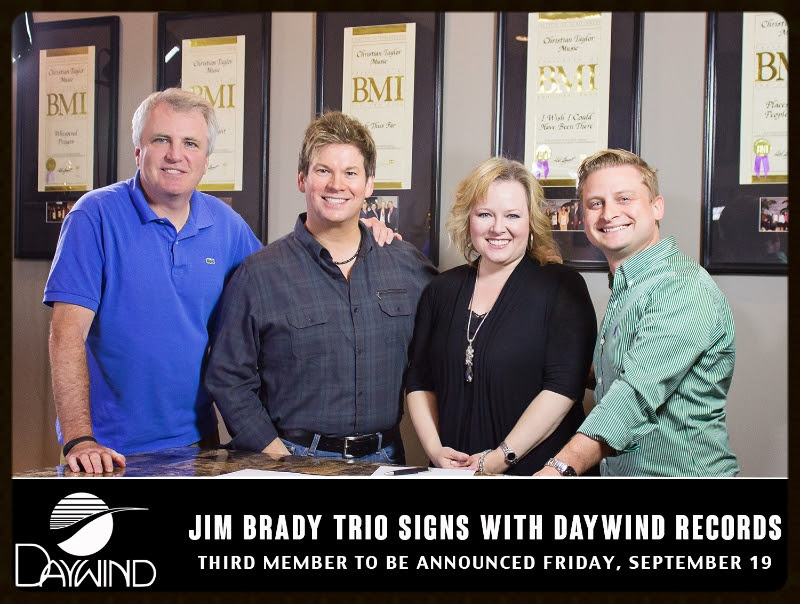 HENDERSONVILLE, Tenn. (September 18, 2014) - Daywind has added the Jim Brady Trio to its stellar artist roster. The group’s first recording will be released in the early 2015. Jim and Melissa Brady made the announcement via video posted to social media and released as a press release. Emerging from his 13 years with the amazing Booth Brothers with the full support of Michael and Ronnie Booth, Brady is excited to join his wife Melissa and their third member in building a ministry of their own in the tradition of Greater Vision, Legacy Five, Dailey and Vincent, Karen Peck and New River, Ivan Parker, Brian Free and Assurance, and the countless other successful ministries of today that were birthed out of other successful ministries. 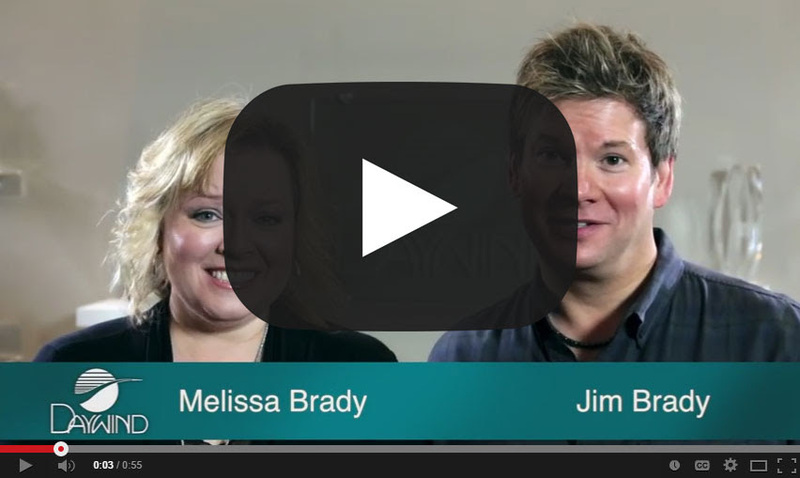 The Jim Brady Trio joins Legacy Five, Greater Vision, Brian Free and Assurance, Tribute, Karen Peck and New River, the Blackwood Brothers, Adam Crabb, Joseph Habedank, the Nelons, the Browders, Wilburn and Wilburn, the Bowling Family and other top Southern Gospel artists on the Daywind roster. Waynesville, NC (September 19, 2014) - Michael Davis & Associates is thrilled to welcome the highly acclaimed music duo, Zane And Donna King, to the Dominion Agency. The couple inked an exclusive booking agreement with the agency today. Zane and Donna have been working in the music industry full-time, collectively, for 40 years. Between the two of them, they've produced upwards of 400 albums, launched countless careers for some of today's top Gospel music acts, and celebrated numerous hit songs as songwriters. Zane owned a record label, Journey Records, which was home to many accomplished artists. Donna toured for years with one of Christian music's top Gospel music trios, Hope's Call. It seems only fitting that the couple combine their musical gifts and share them, together, with audiences in churches and concert halls wherever God opens the doors. Michael Davis, president and CEO of Michael Davis & Associates shares, "Two of the most talented people I know are Zane and Donna King. This dynamic duo will bless you to pieces. I am very excited they have chosen to take their music ministry on the road and look forward to representing them as their booking agent." Their exclusive agreement with the Dominion Agency will be the vehicle by which churches, fans, and event goers can experience, not only the impeccable talent of the duo, but, most importantly, their heart for GOD and their deep love for people. Donna will also be available for limited solo appearances, including womens' events, both speaking and singing. "Many folks know, in addition to making music with my precious wife, Donna, I am blessed to work fulltime for Compassion International," expresses Zane. He continues, "I have learned, first hand, that there are many forms of poverty on this mighty big planet. Those in extreme physical poverty are often the most grateful people you'll ever meet. One of the most devestating forms of poverty is to have a wealth of possessions while, at the same time, starving spiritually. My wife and I feel blessed to have an opportunity to offer the hope of Christ, through music, to a hurting world. We want to help make people smile, breathe, laugh a little, tap their toe, and, most of all, come to decisions that will make their lives richer." Zane concludes, "A rich life is not one that contains a large bank account. It's found in simply knowing the grace of God and walking closely with Him." The duo has already experienced a remarkable response to their music. Recent radio hits "Hallelujah, Jesus Saves" and "SHINE" both landed in the Top 15 on the Singing News Top 80 charts over the past year. And, both songs were co-written by Donna. Their newest single, heading to radio next week, is entitled "No One Like God." And that is the message they look forward to expressing to the world. Donna states, "Truly, there is "NO ONE LIKE GOD. What a privilege to point others to His love." To find out more about hosting Zane and Donna King at your church, conference, or concert event, contact Michael Davis at the Dominion Agency. You can do so through the website, dominionagency.com, or by calling 828-454-5900. To learn more about all of the artists who call the Dominion Agency and Michael Davis & Associates home, visit michaeldavisandassociates.com. Follow Donna on Twitter @mrsdonnaking. You can also visit Donna's website. (She is available for limited speaking and singing events, including women's events and music teaching events). That website is donnakingmusic.com. If you would like to learn more about a ministry that is near and dear to Zane and Donna, Compassion International, visit compassion.com. View the video by clicking on the image above. WYNDMOOR, Penn., Sept. 18, 2014 /Christian Newswire/ -- Dunn Pearson, Jr., noted for his celebrity as a prolific pianist/composer and record producer/arranger having scored for some of the biggest names in Entertainment and film, such as "New York Undercover" theme song, "Native Son" the movie featuring Oprah Winfrey, Superbowl Commercials for Wendy's and McDonald's, former music director for the Multi-Award winning "OJays," "Mary J. Blige," "D'Angelo," "Stephanie Mills," and "TONY" winner "Melba Moore" to name a few, spent his formative years in a domestic violent household where both he and his mother were abused by his stepfather, yet, he learned effective tools to destroy the cycle that is so often perpetuated by abusers and abuse-victims. Dunn, through education and love of the arts found a discipline that created an escape from an abusive-stepfather and upon becoming a father, decided to make better choices for his family and is scheduling a national speaking tour in 2015 to help males develop coping strategies that will enrich their lives, first starting with communication. Dunn frequently talks about "So often celebrities are viewed as individuals with everything in tact because of fame and money when in essence we are still wrestling with demons just like everyone else, and have to be reminded that we have power to choose our actions. And my primary focus for stepping onto this stage is to help young males see their environment is not a death sentence but the beginning sentence to a paragraph of life they get to write; to achieve a better life you have to get better at living." Although he is very involved in entertainment, Dunn realized his life is a success story and has chosen to be an ADVOCATE to help destroy the cycle of abusive behavior patterns in males that stem from learnt behavior through strategies he used to conquer the darkest periods of his life as a teenager. Pearson is slated to release his long-awaited movie based on adaptation of his life story "UNHINGED" which depicts a candid visual of living in a violent riddled household this winter of 2014. As a first-time author, Dunn Pearson is publishing two new books with Hollis Media Group "MASCULINE VULNERABILITY" & "SOMETHING ABOUT THE HOUR." Call Roy Graves for tickets at (864) 237-3214Seating is limited to 300 so call today! Nashville, TN (September 18, 2014) Angela Primm is no doubt known for being the most successful backup singer in the recording industry throughout all of Nashville. You have her melodious voice on such recordings as Reba McEntire, Aretha Franklin, Dolly Parton, Andre' Crouch, Barbara Mandrell, Patti Austin, Bill Gaither, and even the late Vestal Goodman. This phenomenal singer who has sung as backup for some of the greatest singers in the world is poised to enter that same arena as a powerhouse Gospel singer in her own right. What better atmosphere to record in than the songs of one of her heroines, namely mega-star herself, Mahalia Jackson. Mahalia Jackson was known for being able to sing the simple songs of the Gospel and bring them to life with her spirited singing. No one can bring as much enthusiasm to Mahalia Jackson's songs than Angela Primm. Angela will be bringing the old standard hymns and spirituals with all the dignity they deserve, yet adding her own personal touch which is sure to rapture your soul to new heights of ecstasy. This is where you come in. Angela Primm needs your help and support to accomplish this enormous task. The total cost of this memorial project, which is sure to touch the lives of millions of souls, is $28,000.00. That sounds like a tremendous amount, but in actuality if Angela's friends and fans who believe in what she does will help just a little, this mountain can become a molehill. The Kickstarter program allows you to be a vital part of the ministry of Angela and also allows you to get a much greater insight into who and what Angela is. There will be many surprises for you the supporters as well as some very nice benefits. How would you like to give a private concert for you and your close friends in the Nashville, TN area? How would you like to have Angela sing Happy Birthday to you or one of your loved ones on the phone, the day of that big birthday? How about on your anniversary? A lot of very exciting things will be happening as a result of this Kickstarter program, plus you will be helping Angela go on about doing the Father's business. $25 - A signed copy of one of Angela's previously recorded CD's (you choose which one) and a personalized hand-written Thank You note from Angela. $50 - An ADVANCE copy of the NEW CD and a personalized hand-written Thank You note from Angela. $100 - INCLUDES an ADVANCE copy of the NEW CD, an autographed picture and a personalized hand-written Thank You note from Angela. $250 - Want Angela to personally call you on the phone and sing your favorite song to you? Here's your chance! INCLUDES an ADVANCE copy of the NEW CD and a - Includes personalized hand-written Thank You note from Angela. $500 - Personalized video greeting from Angela and her singing a song of your choice! Includes an autographed Angela Primm picture, an autographed copy of the NEW CD as well as her current CD and a personalized hand-written Thank You note from Angela. $2500 – (Limit 4) Here's your chance to have Angela sing LIVE at your church! Angela will come to your church and perform a concert and/or perform as part of the worship service, whichever you desire. (within 250 mile radius of Nashville) Also includes a private meeting before the concert for you and a few close friends as well as an autographed copy of the new CD. $5000 – (Limit 2) Not close to Nashville but still want Angela to sing at your church? Here's how! Angela will visit your church (anywhere in the continental US) and perform a concert and/or perform as part of the worship service, whichever you desire. (Travel and lodging accommodations INCLUDED) This also INCLUDES an autographed copy of the NEW CD. $10,000 – (Limit 2) WOW!!! Come to Nashville and spend the day with Angela! She will show you around Music City and take you on a tour of one of Nashville's famous recording studios! INCLUDES an autographed copy of the NEW CD. (you must provide your own travel and lodging) Your name will be printed in a special thank you section inside the CD booklet of my new album. September 17, 2014 – The Rick Webb Family is proud to announce a partnership with Energize Ministries, based in Winston-Salem, NC. The organization provides encouragement and refreshment to local church pastors through counseling, unique retreats and ongoing accountability services. The Rick Webb Family will perform special benefit concerts throughout the year and provide exposure to the ministry through their yearly concert schedule. The first concert is scheduled for Sunday, October 5, 2014 at Christ Wesleyan Church in Winston-Salem, NC at7:00 PM. The Rick Webb Family is celebrating 30 years in music ministry. 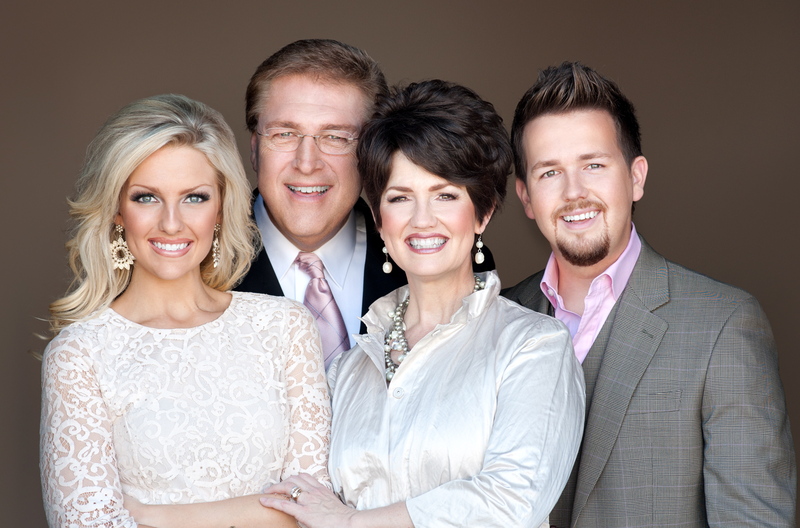 The group is known for their musical excellence and strong biblically based programs. They have appeared at some of the largest churches in America and alongside giants of the faith such as Dr. Charles Stanley, Dr. Charles Colson, Dr. David Jeremiah and Dr. D. James Kennedy – just to name a few. Their latest project Committed to the Call is available from Song Garden Music Group. For more information on Energize Ministries, visitwww.energizeministries.com. For more information on The Rick Webb Family, visit www.rickwebbfamilymusic.com.